Friday happy hour at Grange, a sprawling bar and restaurant in the fashionable Citizen Hotel in downtown Sacramento. As the weekend crowd trickles in, head bartender Ryan Seng is hard at work, preparing drinks from Grange’s adventurous bar menu: a Gin & Tonic variation with rose petal–infused gin and snap peas; a boozy Scotch cocktail softened with banana liqueur; a French 75 freshened up with fennel. The guests to my left—who I later learn are in town for a conference—seem a bit overwhelmed by it all. After considering and discussing all their options for several minutes, one of the women orders a Vodka Soda. Without missing a beat, Seng asks, “Mind if I make that fancy for you?” while reaching for the candied citrus peels. Seng knows a little nudge can encourage customers to try the unfamiliar in a town filled with politicians, lobbyists and others unaccustomed to taking chances. Sacramento is California’s state capital, and some government buildings are visible from the bar at Grange. As with other capital cities, the political population can be conservative in their drinking habits. 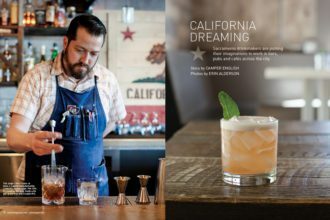 In contrast, Sacramento is home to some of California’s most creative bartenders, brewers and baristas, and bartenders in the downtown area are echoing Seng’s efforts to entice customers to try something new. At Grange, Seng combines imaginative ingredients with familiar spirits, while nearby at Hock Farm Craft & Provisions, beverage manager Brad Peters crafts brightly colored drinks dubbed with familiar-sounding names, though his variations push the boundaries of the classics: the Improved Lavender Sidecar, for example, combines an eau de vie infused with a floral tea, and the Margarita de la Primavera plays bitter Campari against the sweetness of strawberries. And at the Ella Dining Room & Bar, The Real Gin & Tonic has been on the menu for years, the customary recipe tweaked by bar manager Chris Dooley with a house tonic made by mixing cinchona bark directly in the glass. The heart of Sacramento includes downtown and Midtown, which together are part of “The Grid,” a flat, 2-square-mile swath of city demarcated by rivers or highways on each side. Sacramento’s cocktail culture first took hold in Midtown—spawning the creation of Midtown Cocktail Week, Sacramento’s annual drinks festival, in 2008—and while interest in cocktails has spread throughout the city, Midtown remains central to the scene. Away from the government offices, drinkers are younger, more casual and more adventurous, and the bars play to this audience. At the Red Rabbit Kitchen & Bar, a roomy gastropub with front and back patios, the nearly circular bar serves cocktails with can’t-miss flavor combinations like bourbon and honey, gin and basil, and rum and pineapple, and the house cocktail is the Krakow Salt Mine, a refreshing mix of Polish bison-grass vodka with apple and ginger. Fresh flavors and white spirits are in many of Red Rabbit’s drinks, but the back bar is populated largely by whiskey. A taste for the spirit is also in evidence at the tiny Block Butcher Bar, where a small cocktail menu features drinks such as the bourbon-based Guy on a Buffalo, with peach and cardamom preserves, and the bar features a large range of international whiskeys from Scotland, Japan, Tasmania and India, served alongside the bar’s housemade charcuterie. Farther afield at Hook & Ladder Manufacturing Company, a restaurant inside an aluminum-roofed Quonset hut, Chris Tucker holds court as beverage director (and bartender). Hook & Ladder’s menu features more than 20 drinks, ranging from the Gentrified Southside—a variation on the classic, made with orange bitters—to the Mariachi Ska, with tequila, allspice and grapefruit. Tucker was one of Sacramento’s early cocktail converts, and lists on his résumé a past stint at The Shady Lady Saloon, which, following its 2009 downtown debut, helped the city’s nascent cocktail scene coalesce. “Everyone pretty much has a tie to Shady Lady, whether they worked there or were influenced by someone who worked there,” Tucker says, adding that before the bar opened, cocktail-curious bartenders were scattered around town in establishments that didn’t necessarily play to their talents. Shady Lady provided an environment where everyone could pool their creative resources. “It was the first time we could all get together under one roof and make drinks,” he says. Seng, another Shady Lady alumnus, agrees. “Five years ago when Shady Lady opened, customers didn’t know about cocktails,” he says. “Shady Lady really taught this town how to drink.” In addition to Tucker and Seng, Shady Lady veterans now tend bar at (or own) establishments including Red Rabbit, Hock Farm and Ella, and the bar was also a launching point for a number of bartenders who then headed to San Francisco bars such as Rickhouse. The Shady Lady has many of the now-common speakeasy-style design elements: pressed-tin ceilings, red patterned wallpaper and risqué vintage photos (as well as a painting by Seng). But the venue is not hidden through a secret door, nor is it filled with tiny alcoves—instead, Shady Lady is open and inviting, with a central square bar jutting out from the back wall. The cocktail menu is classics-heavy, with drinks such as the Blood and Sand and the Corpse Reviver #2, but Sacramento’s contemporary side is also represented with drinks like the Blood Moon—with Aperol, Fernet-Branca, falernum and grapefruit. Just as a handful of bartenders helped Sacramento’s cocktail culture take root and spread, the city’s coffee community may have started small, but is now going strong. “Sacramento is a hidden gem of the coffee world,” says Lucky Rodrigues, co-founder and partner of Insight Coffee Roasters. Rodrigues says that over the past five years, Sacramento’s coffee scene has exploded, and there are now a number of companies sourcing, roasting and brewing great coffee, with multiple locations. “We’re finding a lot of very educated coffee drinkers here, and a lot of people who are very supportive of young independent businesses,” he says. Insight’s Southside Café is housed in an airy, stylish, standalone building with big windows and benches facing the street, and communal tables inside. Rodrigues and his staff roast coffee in the back for Insight’s three Sacramento cafes, and offer free cuppings twice weekly in an onsite tasting room. Since opening in 2011, Insight has built direct relationships with producers in Central and South America, and plans to expand into Indonesia and Africa within the next two years. “Our goal was to celebrate and expose all of the components that go into coffee of great quality, from the communities of the producing countries all the way through exporters and importers and roasting,” Rodrigues says. It’s a similar story at Temple Coffee’s roastery in Midtown, where owner Sean Kohmescher says most of the roasts will be direct-sourced this year. In addition to the Midtown café, which offers coffee classes, Temple has another café in the Arden Arcade neighborhood, plus a downtown location with Danish-inspired design and huge communal tables. At this downtown café, the emphasis is on brewing, with a pour-over bar and all coffees available brewed for French press. Meanwhile, Chocolate Fish bills itself as a New Zealand–style coffee shop (the name refers to a Kiwi confection), and has a small outpost downtown and a larger roastery in East Sacramento. Their local claim to fame comes from a format in which they serve their coffee. Chocolate Fish’s Nitro Coffee is first flash-brewed and refrigerated, then charged multiple times with nitrogen gas in a keg over the course of 36 hours before being poured from a tap; it resembles a foamy glass of Guinness and has been dubbed “morning beer” by locals. In addition to the roaster’s East Sacramento location, the nitro coffee is available at Hook & Ladder, which was a test site for the kegged coffee. Tucker worked with Chocolate Fish to select different blends for the bar, and this summer he plans to feature a bright and citrusy brew to help beat the season’s heat. Sacramento temperatures rarely dip below 40 degrees, and while daytime temps during the summer often reach the 90s, the evenings are usually cooler and more comfortable. In response, most bars and restaurants have outdoor patios, and many have one in front and another in the back. Combine the warm weather with the prevalence of outdoor seating, and you have a perfect environment for drinking beer. “We’ve been pretty fortunate, being in Northern California, that we’ve had access to really great craft beer for a long time,” says Clay Nutting, an owner of LowBrau Bierhall, which opened in 2012. The city is surrounded in its outskirts and in neighboring towns by breweries. Berryessa Brewing Company, in nearby Winters, specializes in unfiltered, naturally carbonated beers, such as a chocolatey Baltic Porter and Propaganda Pils, laced with noble hops. Sudwerk Brewery, in the college town of Davis, makes German-style Märzen and Lagers, while Knee Deep Brewing in Auburn focuses on profoundly hoppy West Coast–style beers, such as Hoptologist Double IPA and Simtra Triple IPA. Hop-forward beers are also the specialty at Loomis Basin Brewing Company, in Loomis, and at Sacramento’s Track 7 Brewing Co., which also features more sessionable beers, such as Alkali Wit and Bee Line Blonde. Closer to downtown is New Helvetia Brewing Company, where they employ a seven-barrel direct-fired brew kettle to make beers ranging from a mild Saison Solon to a robust Thunderbeast IPA. New Helvetia’s brewers have also collaborated with the local roasters at Naked Coffee to produce the special-edition Naked Coffee Stout, and with Insight Coffee to make Southisack Coffee Chili Stout, flavored with cold brew and Thai chilis. To enjoy Sacramento’s bounty of beer, head for places like The Shack, a former drive-in dating to 1931 that could easily pass for a beach-adjacent hut in Santa Monica instead of East Sacramento. It has a bright yellow-and-green exterior and a big Christmas light–illuminated patio on which drinkers are invited to doodle in colored chalk. In keeping with the idea of outdoor drinking, The Shack’s beer selection features many on the session side, with Belgian blondes and saisons alongside tart lambics and fruit beers, though those seeking more rugged beer can also tap into the Trappist selections, or have one of the West Coast’s signature IPAs. Similarly casual but more centrally located in Midtown, Der Biergarten is an open-air space in a former vacant lot that now houses a shipping container from which 32 tap beers are poured. The long communal tables in the yard were shipped to Sacramento from relatives in Germany, and the tap list has similar Old World connections, with beers such as Cölner Hofbräu Fruh Kolsch and Erdinger Dunkelweizen served in half- or full-liter steins. Not far away is LowBrau Bierhall—also themed as a beer garden, but this one mostly indoors. Here, the design is more modern, with walls adorned with birch logs, cuckoo clocks and a gold-painted stag’s head surrounding the oversized tables. LowBrau features 14 beers on tap, with selections ranging from Hofbrau Dunkel to the local Ruhstaller Capt. California Black IPA, and what owner Clay Nutting calls a “beer nerd” menu with bottle selections like Anchorage Brewing’s Between the Staves, a sour ale fermented with 3 strains of yeast and aged for 11 months in Cognac barrels. Camper English is a jet-setting cocktail journalist/speaker/consultant who is *that guy* with all the questions on the distillery tour. Find more of his work at Alcademics, or buy him a drink if you see him at the bar in his hometown, San Francisco. A new-school Chardonnay that’s perfect for your Thanksgiving festivities.